Yes, I’ve talked on here about the dangers of a 3.5-point favorite spread, but the Giants bounced back beautifully from a bad Week 13 loss in Pittsburgh to sweep the white-hot Cowboys. Detroit is primed for a letdown despite winning eight of nine, and this Giants team, though somewhat Jekyll-and-Hyde, looks poised to make a late-season run. Pick: Giants. This one could turn into a straight-up upset, although I still give the Packers a slight edge. But there are a couple of “we’ve seen this movie before” trends in play here. The first is, “here come the Packers again.” After a dreadful 4-6 start, they are back in the hunt at 7-6. But the other trend is, “the whole world is suddenly back on the Packers.” Aaron Rodgers is banged-up, and the truth is Green Bay isn’t as good as it has looked in recent weeks, even coming off a 38-10 thumping of Seattle. The Bears would love nothing more than to effectively end their biggest rivals’ playoff dream, and should at least bring this one down to the wire. Pick: Bears. With or without Adrian Peterson, this Vikings team could regain their mojo and make a playoff run here in these final weeks. The Colts and their soft defense come to town, a perfect patsy, perhaps, for a Minnesota club that has regained its footing after a miserable 1-5 stretch following a 5-0 start. As long as Sam Bradford and the offense can avoid the turnovers, the reeling Colts don’t figure to have enough to pull the road upset. Pick: Vikings. Okay, so another 3.5-pointer, but can you possibly believe that Tom Brady is 2-7 lifetime in Denver? This is a man whose lifetime record is 202-61 (.768) in the regular season and postseason combined. The only two Broncos quarterbacks he has defeated at Mile High are Danny Kanell and Tim Tebow. But with the Broncos’ inability to run the ball, it could make for a long day for Trevor Siemian. 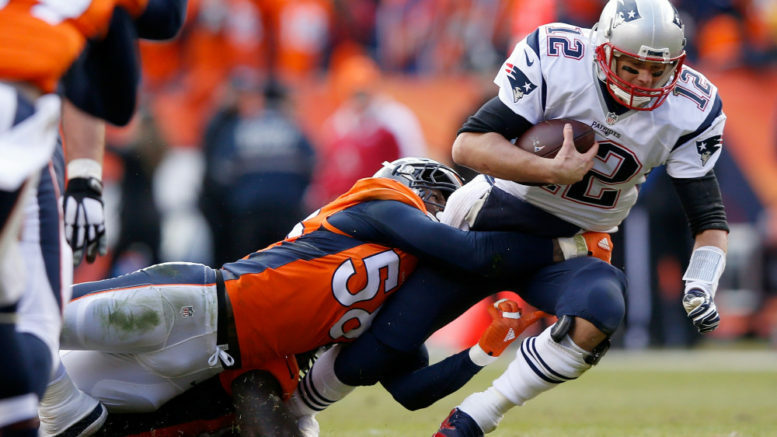 The Broncos defense certainly has the ability to pressure Brady, but only if the Broncos can get a lead, which may be difficult given the offense’s recent struggles. And if there is one thing that has proven to be a safe bet over the years, it’s the Patriots in a revenge game. Don’t think Brady, Belichick and Co. have forgotten two losses in Denver last year, including the AFC championship game. Pick: Patriots. The Redskins are quietly making a push for another playoff appearance, and their last primetime television appearance went quite well in a 42-24 ambush of the Packers. In to town come the 5-8 Panthers, out of the playoff hunt and coming off their own embarrassing primetime loss two weeks ago in Seattle (40-7). So this one seems easy, right? Though the Redskins should beat the defending NFC champs, all the pressure is on Washington, and Carolina may still have just enough fight left to give Washington a scare. Despite this sorry 2016 season, the Panthers are still 19-5 in December/January regular-season games under Ron Rivera. Expect a spirited enough effort by the Panthers to cover. Pick: Panthers. Be the first to comment on "NFL Week 15 Picks: Time to Stay Hot"